LAST WEEK WAS WEEK #28 SO THIS WEEK IS #27. JUST 27 MORE WEEKS TO WORK UNTIL WE’RE ON VACATION AGAIN. JEEES, THAT A LONG TIME. 29 WEEKS IS THE LONGEST I’VE EVER WORKED AT THE AVI IN ONE SEASON, AND 28 THIS SEASON, COMES IN SECOND. WORKING SO MANY WEEKS IS OUR WAY OF MAKING UP FOR THE “GLOOM & DOOM” CONDITIONS IN NEVADA. WE CUT OUR FALL VACATION BY ABOUT 6 WEEKS, AND WE ADDED 1 WEEK AT THE END IN THE SPRING. THE “BELIZE FUND” DIDN’T MATURE TO THE POINT OF GOING TO BELIZE WITH HANS AND WENDY THIS FALL, BUT WE DID NOT SPEND ANY OF THE MONEY. 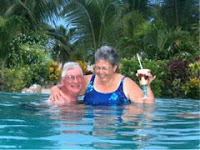 WE HOPE ONE OF THESE YEARS IT TURNS INTO A RETURN TRIP TO AMBERGRIS CAYE AND CAYE CAULKER. RETURNING TO THE AVI TO WORK FOR THE SEASON IS ALWAYS FUN. WE CATCH UP WITH OLD FRIENDS WHO WORK THERE, THE LOCALS, AND AS SNOWBIRDS CONTINUE TO ARRIVE THERE ARE LOTS OF SUMMER ADVENTURES TO CATCH UP ON. WHO GOT FIRED, WHO GOT DIVORCED, WHO QUIT, WHO’S SLEEPING WITH WHOM? IT ALL KEEPS THE BREAK ROOM A BUZZ AS WE’RE FILLED IN AND MARY AND I COMPARE STORIES AT HOME. Uncle Hans in '08 ??? ?